If you have a turtle you want to rehome, contact us. We will take in many species if we have the space. 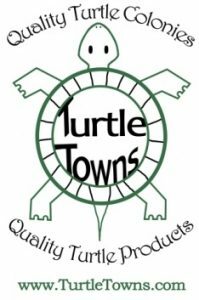 The 3 species we will not accept are, Red Ear Sliders, Snapping Turtles, and Sulcata Tortoises. We will help you rehome them though if possible. It is illegal to release your turtle into the wild for any reason. It can be extremely dangerous to our native turtles in many ways. DO NOT release an animal into the wild. Even if it were legal, releasing a pet into the wild will almost surely kill the turtle. Even moving native species from one area to another is a death sentence, so releasing a pet should never happen for any reason. DO NOT release any turtles into the wild. Have we gotten our point across yet? The Red Ear Slider – 90% of the calls we get for rehoming a pet turtle are for a Red Ear Slider. This is the most common turtle in the pet trade and is unfortunately a menace to society. They are cheap, easy to find, grow fast and get large enough that care is difficult without an expensive setup. They are not native to our area but unfortunately do well here. However, they are far more aggressive than our native pond turtles and will destroy food chains and wipe out our native turtles. If you have one we recommend posting an ad on craigslist in the pet section for an adoption. If you include the tank, setup etc, you’re more likely to find someone quicker. When people want to “try” a pet turtle, my advice is to adopt a slider first. We keep a list of people who are trying to rehome sliders in hopes that someone will call looking to adopt. It rarely happens… but if you want to get on our list of people needing help, please send us an email with whatever info you have. If you want to adopt- PLEASE CALL US! Other species are far more easy to rehome and we’ll even take in some species if we have space. When we adopt a turtle into our collection it must go through a minimum 2 month quarantine and adjustment period before being introduced to any of our setups. This is stressful for the turtle but a necessary part of safe interaction. While we won’t accept sliders, sulcata or snapping turtles, we will accept most other species. However, native species to Pennsylvania are not legal to own with only a few exceptions. Therefore we cannot and will not accept native turtles at this time. Perhaps some day when we have ample time and money we’ll look into forming a true rescue organization. But for now, we can’t accept PA species.